When your project requires deep draw forming with repeatable graphic registration, Hytech’s AccuForm® high-pressure forming process is the answer. The patented AccuForm® process was initially developed in the early 1990s specifically for a new manufacturing process called in-mold decoration. The in-mold decoration process is also referred to as IMD, IML or FIM. This new manufacturing process utilized screen-printed film placed in an injection mold. During the mold cycle, resin is shot typically on the backside of the film. When the mold opens, the part is decorated and ready for assembly. The Hytech high-pressure forming process was developed to provide customers with a process that would allow for precise and repeatable registration of graphics. What sets the Hytech process apart from others on the market is HOW and WHERE the material is heated. The HOW refers to the AccuForm® method of heating the film prior to forming. With this process the film is heated under pressure and held perfectly flat. This heating method prevents the film from sagging as it does with ALL other heated forming methods. The WHERE refers to the location of the film during the heating process. With the AccuForm® process, the film is heated directly above the forming tool. This heating location is unique to the AccuForm® process. With ALL other heated forming processes this is not the case. By heating directly above the forming tool, the forming process takes place the instant the material reaches the optimal forming temperature. With other technologies either the sheet or the heaters must move before forming. This moving delay requires the material be overheated in order to compensate and be at the correct temperature for forming. Overheating the film creates stress and increases variation from cycle to cycle. Today the patented Hytech AccuForm® processes is one of the industries most repeatable forming processes. The equipment design along with the supporting tooling and process know how come together to provide customers with a total solution. The total solution is what separates the Hytech AccuForm® high-pressure forming machine from other machines on the market today. 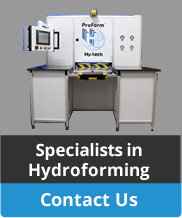 Contact us to see how this forming technology can solve your most difficult high-pressure forming challenges. Let’s form the future together. Call 602-944-1526.